Here's what everyone wore on the red carpet at the 2017 Grammy Awards. 1. 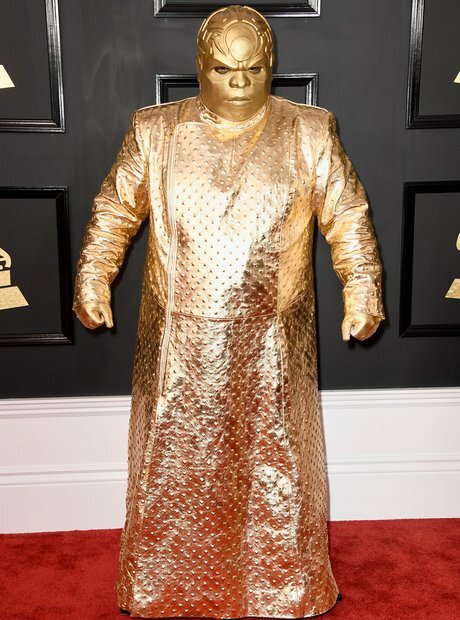 CeeLo Green raised many questions after showing up in this wacky gold costume. 2. Rihanna looked stunning in a shimmering orange crop top and full black skirt. 3. Jennifer Lopez was pretty in pink in this silky ruffled dress. 4. Solange Knowles shone in a glistening gold number. 5. DJ Khaled looked sharp at this year's awards. 6. Chrissy Teigen rocked a slinky black dress, whilst John Legend rocked a black and pink ensemble. 7. 2-time Grammy winner Chance The Rapper rocked his signature cap. 8. Anderson Paak hit up the red carpet in this half-suit half-skirt combination. 9. Camila Cabello looked like a princess in this floaty gown. 10. Partynextdoor was dressed to perfection in this classy black suit. 11. Lady Gaga shocked in typical Gaga style with this racy PVC outfit.